Montabert has the reputation for manufacturing the highest quality rock breakers in the world. Monty Product’s Montabert range offers high production, unsurpassed reliability, low maintenance, long working life and equipped with innovative features. 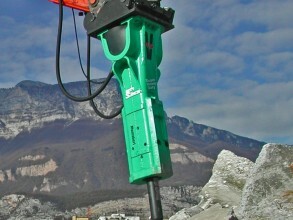 The choice of a Montabert Hydraulic Breaker is an investment which will maximise the profitability of your work. Wheather you are breaking rock or concrete, or are excavating, Montabert hydraulic breakers guarantee optimum performance for all your projects. Greater power to weight ratio, allowing the use of lighter carriers for the same output as competitors heavier models. Narrow profiled cradle, offering better visibility and maneuverability whilst working in tight trenches. A narrow profile means less backfill. 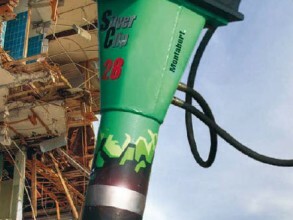 Three stage piston transmits long shock waves into work for greater productivity. Sealed accumulators are fully hydraulic with a diaphragm, offering the longest charge life in the industry. V Technology (only on select models) allows the breaker to sense the hardness of the material and adjusts the breaker’s blow energy and frequency, automatically. TPS Technology (only on select models) prevents premature tool breakage, extends the life of upper and lower bushings, along with extending the life and wear on retaining pins. Auto lube system (only on select models) protects the tool and bushings by keeping them lubricated and preventing premature wear. Metro silencing is available for sensitive sites where noise restrictions apply. 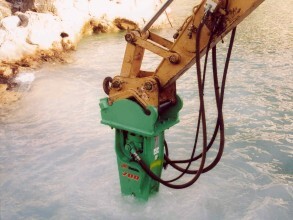 Montabert Rock Breakers have the highest resale value in the industry. Their reliability ensures downtime is kept to a minimum, therefore minimising operation costs and lengthening the lifespan of the breaker and excavator. For high-quality rock breakers, contact Monty Products today.